The ATLAS Production Studio, located on Level B-2 in the ATLAS Building, is a 1,000 square-foot facility that was opened in 2006. 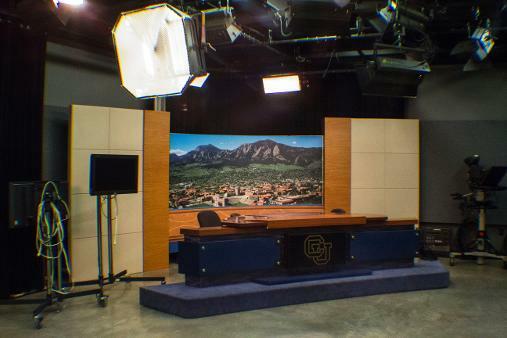 This studio environment provides students with authentic TV studio production experience. Although it currently uses standard definition the studio will soon become converted to high-definition. Chyron character generator and a prompter system that uses Inception software. The ATLAS studio gives students several opportunities to learn and practise their trade, developing professional-quality resume material. Classes like NewsTeam and extracurricular shows like Sports Mag rely heavily on the studio to help them cover campus news. The studio is more than just a lab – it’s a facility that makes it flexible for broadcast students to produce a wide range of programming. 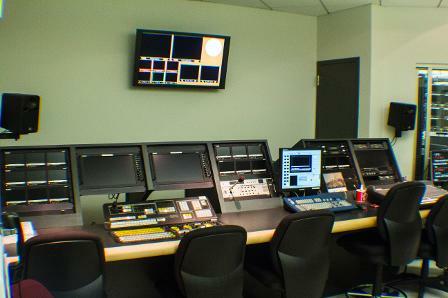 In TV-1, students will get the opportunity to work cameras, run the video switcher, Chyron character generator, audio board, prompter and video server. This installation is where students work behind-the-scenes, assembling video productions as they occur live. Professional control rooms vary in appearance, and some stations will operate out of separate rooms. But in principle, the installation operates much the same. The video monitor on the wall shows the various camera, graphics and video sources. On the desk there are several control panels that allow for the selection of video and audio sources, character generator and teleprompter. The director sits in the centre where they oversee the creative integration of all the production elements. Each station also includes intercom connections for headsets that are used to communicate with personnel in the studio. 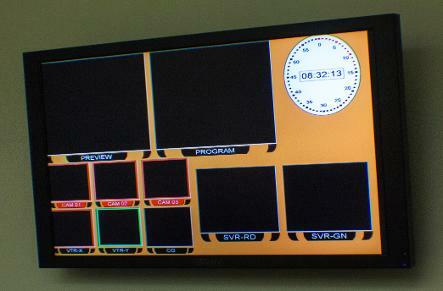 This monitor hangs directly in front of the control room desk and views a number of production elements. 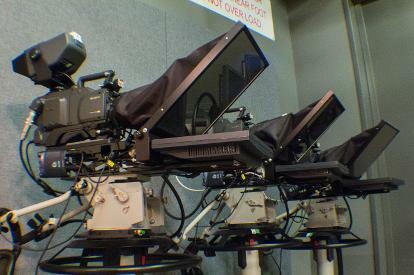 The two larger screens are used to Preview video sources and the Program monitor shows the outgoing product either for the recording of live television or directly to tape, DVD or into the video server itself. Additionally, the Video Monitor shows the graphics, camera sources and other video sources. Other installations may have the entire wall covered in several TV and computer monitors capable of displaying multiple sources. 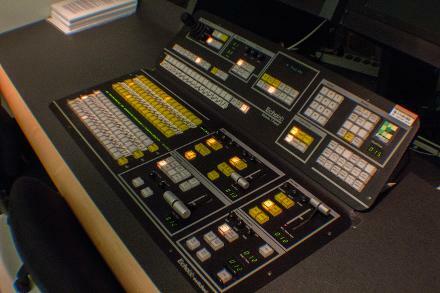 Also known as the "vision mixer" this control console is used to select from multiple video and graphic sources. The station is operated by the Technical Director who inserts the video elements, as the director calls for them, into the outgoing program. 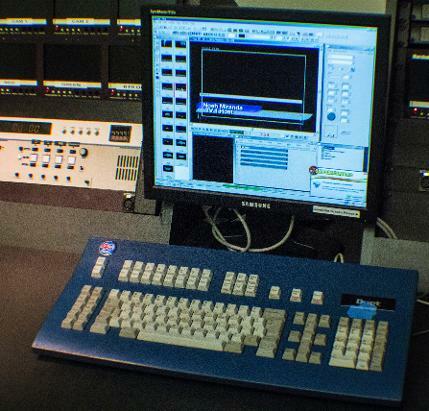 This console is used to create the names (lower thirds) and other full-screen digital graphics that are then inserted, or superimposed over the program video. The CG operator calls up the graphic and then transfers it to the downstream keyer. The TD accesses the keyer on the video switcher where they can then "key-in" the graphic over the video. This 24-channel console electronically combines, or mixes, audio from several sources, including microphones, video sources and a CD player. The audio mixer is used to change the sound levels of any source, making sure that the signals produced have levels consistent with broadcast quality. Other features allow the operator to change the dynamic quality of the audio and also to route audio to other locations like the studio. This device displays a visual text to the talent speaking. The talent reads off a screen that is directly below the camera lens, but is reflected to their eyes by a piece of glass. 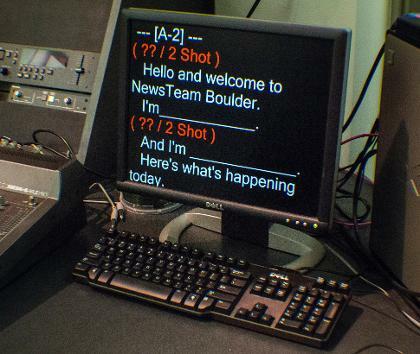 The prompter software is supported by EZ News, an integrated news production system that is used extensively in our broadcast production classes. The teleprompter feature pulls in content directly from rundowns and scripts, updating in real-time as changes are made. This room is located to the side of the control room. The laptop controls the video server, which is used frequently in many of our productions. 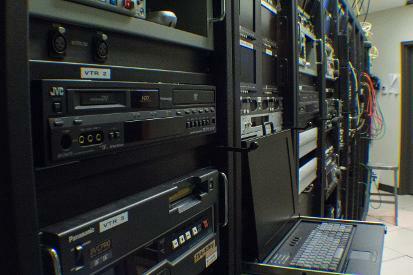 The video server is a computer-based device that records and stores video and audio. Hundreds of hours-worth of video can be stored for later playback in the server. Other devices found in this room include a pair of DVD recorders/players, mini-DV decks, BetaCam and 3/4 decks. The use of tape formats has greatly diminished since most video can be stored and played back from the server without any degradation of signal. The studio camera is where light enters the lens and become transformed into a video signal. This electrical signal is then conveyed to the picture monitors and video switcher in the control room, which then converts the signal back into an image we can see. The camera is comprised of the lens, imaging device and viewfinder all mounted onto a pedestal that can be wheeled smoothly across the studio floor. The height of the pedestal can also be adjusted and the camera head Each camera is also fitted with teleprompter monitors just below the lens. The camera is attached to the camera support that allows for smooth pans and tilts. The handlebars are fitted with zoom and focus controls. The viewfinder is a monochrome (black & white) monitor that displays the image for the purpose of framing and focus. The angle can be adjusted to provide ideal viewing no matter the height of the operator or of the camera. The grid in the studio ceiling is used to attach a multitude of lights that are then operated using a computerised panel. 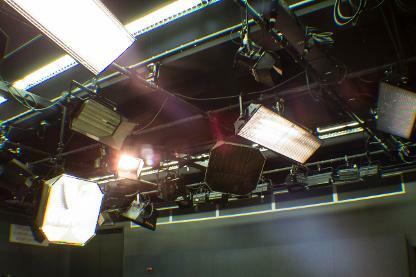 These lights are comprised of hot lights (Tungsten) and cool lights (Fluorescents). Tungstens are available in many configurations including spotlights and floods. Fluorescents are becoming more popular in studios because they produce low volumes of heat while projected a softer, diffused, skin-flattering quality of light. 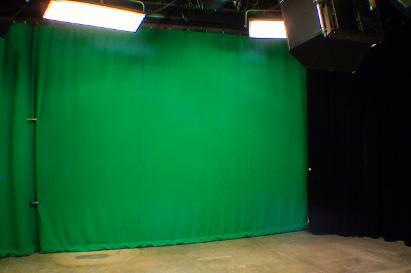 This green curtain is used when productions call for chroma-keying, a technique for compositing two images or video streams together based on colour hues. The green is electronically removed from the image, making it transparent, revealing another image behind. Also known as colour-separation overlay (CSO), chroma keying can be done using backgrounds of any uniform colour, and as long as the same colour isn't visible on the talent or objects in the foreground. It is commonly used for weather forecasts broadcasts where the talent is seen standing in front of a weather graphics, but in actuality they are standing in front of a green or blue screen.